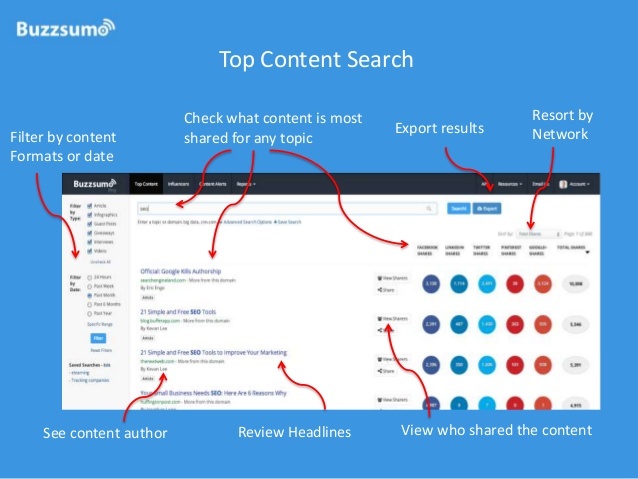 For those of you who don’t know, and it’s probably the majority of you, Buzzsumo is a content marketing intelligence tool aimed at identifying what content is going most viral on the Internet and who the most influential people are that are amplifying it’s viral spread. Notice here that one of the main reasons customers would signup to pay for the service is to identify key influencers in their vertical! If you haven’t guessed by now, that function is exactly what we’ll be harping on. The best part, it’s free to use for sales reps! Just be wary that you’ll be limited to 3 free queries per IP address. The URL of a company you consider a competitor. This is where your prospects might go as an alternative to your solution or product. This is also the plan we recommend the most. Your company’s URL or piece of content that was used to attract ideal leads. Now that you’ve equipped yourself with a piece of shareable content, it’s time to take the next steps. Please note: you’re only able to perform THREE free searches from the same IP Address. So make sure you come equipped with a good plan of attack in mind! 5. Each sharer will also have their Twitter account available to follow on the right side. Note: in the free account only 8 people will show. 6. Click their twitter account to get their full name and twitter profile. 7. From there it’s up to you as to how to precede next steps! My biggest recommendation is to reach out through LinkedIn and note the fact that you saw they shared a piece of content on Twitter that both of you are interested in.